1. What Are Hearing Loop Systems? 2. Why Use a Hearing Loop? 3. What Advantages Do Hearing Loop Systems Have? 4. Where Are Hearing Loops Used? 5. How Do You know if a Loop System is Installed? 6. Where Are Hearing Loops Currently Installed Throughout the U.S. and the World? 8. What Types of Hearing Loops Are There? 9. What System Do I Need? The technical name is Audio Frequency Induction Loop System, but Loop, Loop System, Hearing Loop system, or Hearing Loop for short. 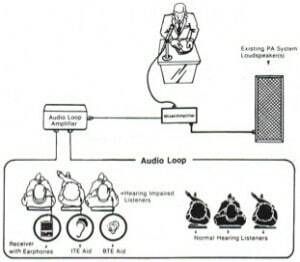 In its most simple form, a hearing loop utilizes a loop of wire around the perimeter of an area that is connected to an induction hearing loop amplifier. An input signal (from a microphone, TV, or etc) is provided to the hearing loop amplifier, and the hearing loop amplifier drives an audio current (note current not voltage) through the loop of wire in the form of a strong alternating current. As the alternating current from the hearing loop amplifier flows through the loop, it creates a magnetic field within the looped area and “induces” the telecoil or T-coil in a hearing instrument, or specifically design hearing loop receiver, within the looped area. When a hearing instrument user switches their hearing aid to the “T” position on the hearing instrument, the telecoil in the hearing instrument picks up the fluctuations in the magnetic field and converts them back into alternating currents. The alternating currents are amplified and converted by the hearing instrument into sound. The input to the hearing loop amplifier can be a sound source such as a television or stereo, a public address or sound reinforcement system, a dedicated microphone, or any sound source that users inside the looped area wish to hear more clearly. Not all loop layouts are a simple single wire surrounding a room, but this explanation illustrates the basic principles. People who suffer from hearing loss require more than just increasing the volume of sound into their ears. The loss of hearing is generally associated with the brain’s neurological processing of information. For people with normal hearing, a signal to noise ratio of 6dB is required for a reasonable level of speech intelligibility. This represents quite a noisy background, and includes sounds such as reverberation, air conditioning, ventilation systems or background noise such as those associated with a crowd of people. When a person loses a lot of their hearing, they generally need a signal to noise ratio of 15 to 20dB for a reasonable level of speech intelligibility. This can be difficult to achieve unless the desired signal is taken straight from the basic source and transmitted directly through the loop system to avoid any reverberation or additional ambient noise. Delivering a pure, clean signal directly to the hearing aid maximizes the benefits of digital hearing aids and delivers the best possible sound possible to the hearing instrument user. What Advantages Do Hearing Loop Systems Have? There are two basic environments in which induction hearing loops are used: transient and extended time. In both environments, the telecoil capability in the hearing instrument is used to listen inductively, which eliminates background noise and greatly increases speech intelligibility for the hearing instrument user. In transient use locations it is impractical to issue and retrieve a receiver / headset and these are often among the worst areas for problems related to speech intelligibility and background noise. The use of an individual’s hearing instrument is a major step to bringing people with hearing loss back into full contact with their environment. Utilizing a telecoil, the hearing instrument user always has their “receiver” with them. Only hearing loop systems provide this capability. • Public areas in airports, railway stations, subways, shopping malls etc. • In extended time use locations there often exists sufficient degradation of signal to seriously affect speech intelligibility. By using a hearing loop system, no additional equipment, i.e. receivers / headsets, is required if a hearing instrument is telecoil equipped. By simply switching to the “T” setting on the hearing instrument, the audio signal is received. This eliminates the need for a facility to pass out, retrieve and maintain equipment, as well as eliminating hygienic concerns. How Do You Know if a Hearing Loop System is Installed? 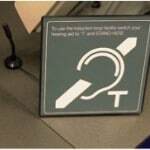 Hearing Loop systems are used throughout the world and there is an internationally recognizable symbol that is used to indicate to the general public that a hearing loop system is installed. The color may vary, occasionally found in green, blue, red, and yellow, but always the basic ear shape usually with something going through it like an arrow, sound wave, and etc. Anytime this symbol is present, a person with a hearing instrument can activate their T-coil or a special receiver can be used to pick up the signal. Where Are Hearing Loops Currently Installed Throughout The US And The World? These are just a few of the locations worldwide that Hearing Loops can be found. Europe has been using this technology for 40-50 years but the US has chosen to use more Infrared and FM systems. • Due to the use of a headset it is obvious that a person is having trouble and many people are uncomfortable putting their hearing disability out there for everyone to know. Most people would prefer to not use the system at all. The most important aspect of a Loop System for a hearing instrument user is the fact that they can continue to wear their hearing instruments and have the sound broadcast directly into their ears. Remember, hearing instruments have a prescriptive value or programming that is vital to clearer hearing. If a person has to remove them to wear a headset, they lose that prescription. It would be like taking ones prescription eyeglasses off to wear non-prescription sunglasses! You just don’t do it. EVEN IF A FACILITY HAS A FM OR INFRARED SYSTEM ALREADY INSTALLED, THEY SHOULD STILL INSTALL A LOOP SYSTEM! What Types of Hearing Loops Are There? There are both residential and commercial Hearing Loops available. The concept is similar but there are differences in the requirements and engineering. Residential Loops are traditionally placed around the perimeter of the room, either at floor level or ceiling level. For a floor level system, the wire can be placed under, behind or on top of the baseboard or under carpet. At ceiling level, wire can be placed in the attic or along the area the ceiling and wall meet or at/near crown molding. A hearing loop system technician will meet with you to discuss all the options. Audio is generally sourced from a TV, DVD player, amplifier, or cable box. However, it is common to provide a microphone or microphones in order to better communicate with friends or family. The mics can be in the form of a boundary mic that sits on a table, a hanging mic as you might find in a choir area, or lapel mic that clips to your collar. Our induction loop installation technician must inspect the location and, in some cases, conduct some tests. From there the appropriate recommendations can be made as to how and where to install the wire. There are many different styles of commercial Hearing Loops just as there are many different types of business. Each business has a unique set of needs and requirements. For example, when a person goes to a bank, there is an expectation of privacy because there is important financial information being discussed. A bank teller may have to repeat him or herself multiple times which allows for the chance that private information may be compromised. How about a physician that has important medical information to discuss or a pharmacist that has crucial prescription facts to explain? An auditorium, activities room, or movie theater in a senior living facility all have different needs than the previous locations. As with Residential, some situations require a Loop wire around the perimeter with an amplifier and others allow for a wireless system. Any large room or area will require a wired system such as an auditorium, cinema, theatre, and places of worship, meeting and lecture rooms/halls. It will require detailed pre-installation testing, engineering, and planning to ensure proper placement of wires and appropriate equipment to obtain adequate signal strength. The Privacy Loop/Supa-T is designed to be installed on or near a counter or desk and provides unobtrusive and continual assistance to hearing instrument wearers. The system is ideal for use in high traffic areas, for example: reception counters, information desks, pharmacies, and doctors offices. The system remains “ON” continuously so hearing instrument wearers do not have to request assistance or activation. Once they are inside the field of the Hearing Loop, they are automatically included as soon as they switch their hearing instrument to the T-coil position. 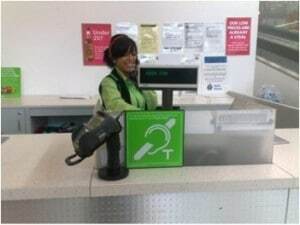 **This system can also be used in reverse, meaning if the counter/service person has a hearing loss, the Loop sign can be turned to face them and the customer can speak into the microphone. This system allows for clear voice communication through secure windows with thick glass which separates the teller/service person from the customer. The teller/service person usually will speak through a small whole or vent in the window which is very difficult for even a person without hearing loss to hear clearly. Even if a microphone is used, often this is not sufficient. This system allows for effective communication between the teller/service person and the customer without compromising personal, private, or financial information even in noisy environments. 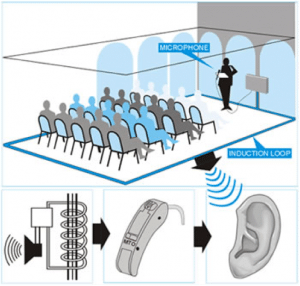 This system is integrated with a Loop to provide assistance for hearing instrument wearers. 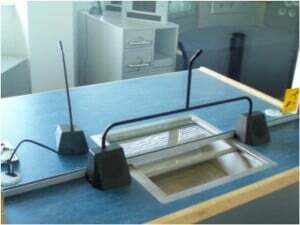 This system is ideal in the following type of situations: bank teller window, ticket window, information window. Each system is stand-alone and individually plugs into a power outlet. The mics are hands-free for both the staff and the customer and is designed to remain “ON” continuously so hearing instrument wearers do not have to request assistance or activation. Once they are inside the field of the Hearing Loop, they are automatically included as soon as they switch their hearing instrument to the T-coil position. The best thing to do is to contact the staff at Complete Hearing Solutions who will consult with you to determine which is the most appropriate system to best suit your business, customer, and/or patient needs. Call or email today for more information, pricing or for an on-site demonstration!